We have just bought our van. 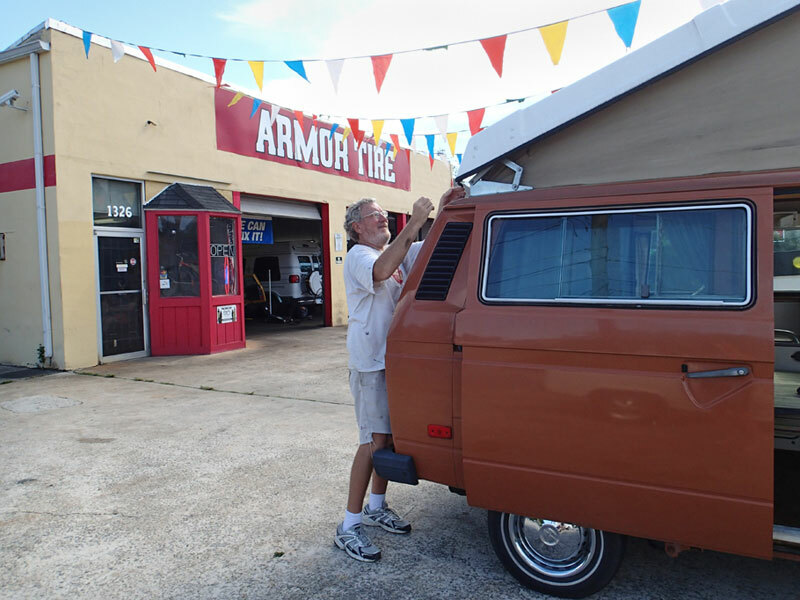 I drive away from the lot a proud 1982 VW diesel Vanagon owner. Iâ€™m driving because it has manual transmission. Duwan will learn to drive a stick later. Now she follows behind me in the Civic, watching to make sure no parts fly off or fluids gush out. In my mind I am already working on a multitude of cosmetic problems. In my mind I consult my new shop manual as I save money by doing my own engine work. But first, letâ€™s pull into this gas station and top off the tank. We will need a starting place to track our mileage. A guy walks over to look while we pump diesel. He says you donâ€™t see many of these on the road anymore. Cool vehicle. Duwan and I smile at each other. As he walks off, I hear a splashing sound. I stop fueling. Ooops. There is diesel spilling out from under the van. We leave quickly. We drive on back roads to Atlanta. At one point I stop because I think the fuel gauge is dropping quickly. But itâ€™s just the minute hand of the analog clock, passing over the gauge. We make it to back to Atlanta fine. The van is pokey. Duwan says that from behind itâ€™s also smoky. We decide to get it to a mechanic tomorrow. 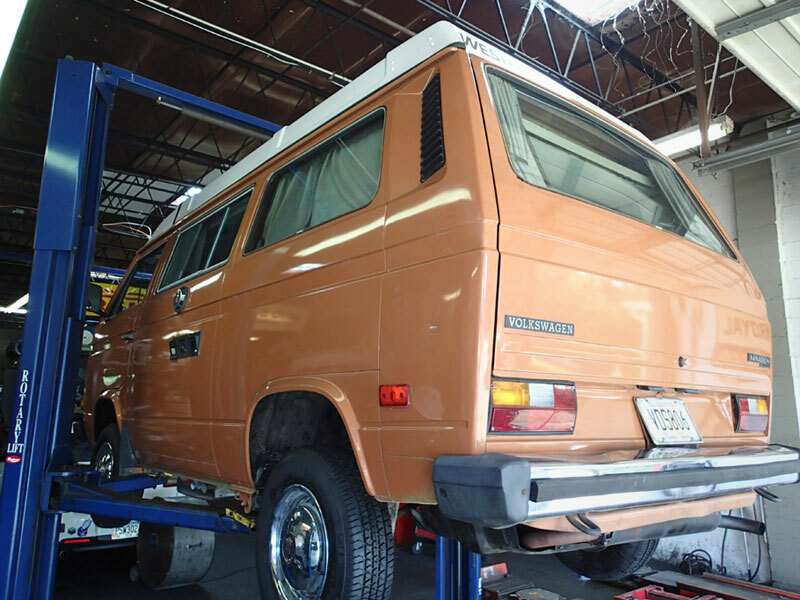 The mechanic calls to say that the van generally looks good, and that the oil leak is a quick, easy fix. We do need a new fuel tank, though. Duwan gives him the OK to order one. Since the van will be in the shop a few days we go take curtains and cushions out for cleaning. We start shopping online for VW parts. We watch how-to fix it videos. The replacement tank should be in on the 26th. We make a plan to drive to Florida the next day to register the van. Early afternoon. Mike the mechanic calls. He sounds tired. It took three hours to take out the old fuel tank. The new one looked different. After researching, he figured out VW had put a leftover 1981 tank in our 1982 vehicle. Surprise! He says they ordered an 81 tank from Pennsylvania. With the upcoming Labor Day weekend he can have the van ready on the 2nd or 3rd. Duwan scrambles to figure out who all asked us to house and pet sit over the holiday weekend. While wait for parts we spend time at the garage cleaning and fixing minor issues. Here Greg fixes the gasket around the pop-top. No one needs house sitting now. We are in guest mode. Weâ€™re lucky to have good friends who will put us up. Called the shop to see if the fuel tank had arrived. Not yet. Mike the mechanic is ready to install as soon as it arrives. He has been pushing the van out of the bay each morning and back in each night. Went over in the afternoon. Finally determined from busy guy at the desk that the tank had not actually been ordered. Mike was surprised too. Short version of the story: I came back for a shower, and Duwan found three tanks online before I dried off. We ordered one. It should arrive Friday, the 5th. Put curtains back on and did more cleaning. Mike the mechanic explains how bigger tires will benefit us. More cleaning. 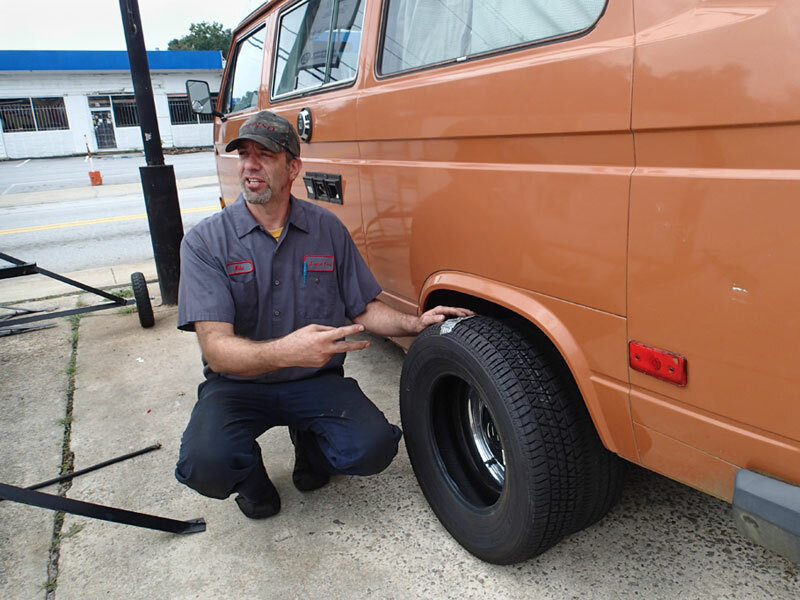 Mike talks us into a new set of tires. The old tires have dry rot. We upgrade from 185s to 195s. FedEx delivers the tank. I drive it over. The van is already on the rack. Mike shows me all the bolts he has tightened on the transmission and under the engine. The tank looks like the correct size. Yay! I take some pictures of the underside while the van is on the rack. Mike calls late afternoon to say that there is still a leak after the tank is installed. He will try again tomorrow. Thatâ€™s OK. Tomorrow is Saturday. If he gets it fixed we still have time to go to Florida. We can drive Sunday and register Monday morning. We havenâ€™t seen our friend Joselyn yet this summer. We get together late in the afternoon at a cafe. After we sit down Mike the mechanic calls. Van is still leaking after re-install with sealing of connections. He wants us to order gaskets for all the connections. Looks like we wonâ€™t be going to FL next week after all. Joselyn says her empty house in Decatur needs a lot of TLC. She also needs to get ready for a big yard sale. We can move in there tomorrow and help her out all next week. Thatâ€™ll work! We couldnâ€™t figure out what parts to order online, so we had to make some calls this morning. We ended up ordering a large gasket from PA, and smaller ones from CA. No one closer had the small gaskets. At least we didnâ€™t have to get them sent from the United Kingdom. The gaskets all arrive at 4:00pm. I take them over to Mike right away. They look like the right stuff. He will reinstall the tank first thing in the morning. The Great A’Tuin goes up the lift in the garage. Mike returns my call about 5:00pm. Heâ€™s stumped. Heâ€™s never seen anything like this. We still have a small leak around the filler tube when the tank is full and the van is stopped quickly going downhill. The filler tube we have looks fine. We could order one and he will put it in. We are way off the clock already. He is just going to charge us for re-installing the tank once, even though heâ€™s lost track of how many times heâ€™s done it. I tell him weâ€™ll come get the van. We can live with losing a few drops. I can probably replace the filler tube later myself if the leak worsens. So, after three weeks I am tooling along again, coal rolling whole neighborhoods with each slow climb up a hill. My sweetheart follows in the Civic, watching to make sure no parts fly off or fluid gushes out. No, our â€˜newâ€™ ride isnâ€™t perfect. But Iâ€™m not even sure where the concept of perfection came from. Good is good enough for me. And I would much rather roll along in good fashion than sit in limbo waiting on something to become perfect. 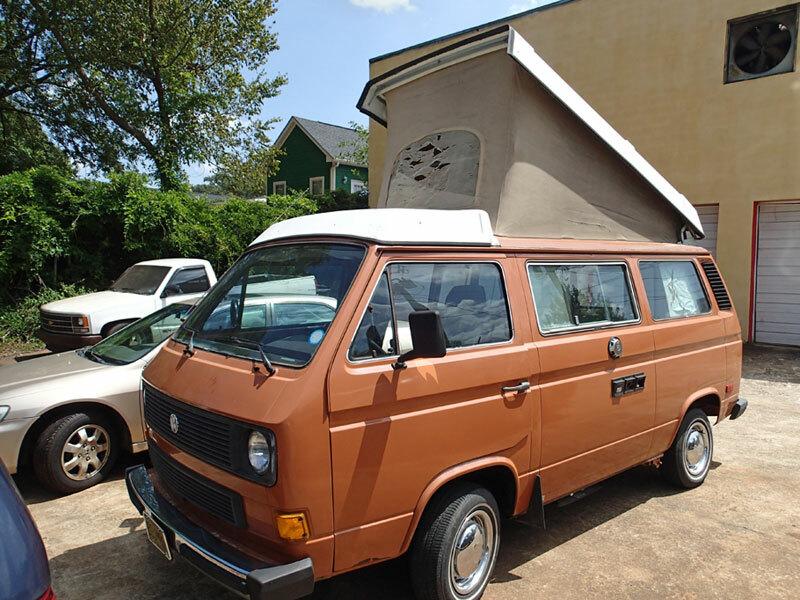 This entry was posted in Van Life, Vanagon Westfalia. Bookmark the permalink. I’ve heard more than once that you need to be a mechanic to own an old VW, or you soon *will* be one! You should do a search for on-line forums for Vanagons. They can be a great resource for handsOn info, parts, and resources. This is exactly what we have decided. There are more tales of woe to come. Greg is going to become a diesel mechanic.